Who Participates in the CORE Program? CORE students come from a variety of backgrounds. Most are undergraduates, primarily juniors and seniors, who major or minor in Outdoor Recreation, Parks, and Human Ecology. However, the CORE curriculum is designed to serve students from all disciplines. Students from outside departments frequently enroll in CORE seeking leadership development and innovative communication and instructional techniques. This often adds a broader spectrum of ideas to our classroom and enhances interdisciplinary communication. Graduate students are also eligible and have regularly participated in the program. How does the selection process for becoming a member of CORE work? CORE students are selected on the basis of their application and a brief interview to determine if the goals of the applicant are congruent with the goals of the program. Students are accepted on a rolling basis starting in the fall semester. The application process usually becomes highly competitive by mid-October. Priority is given to upperclassmen in the Recreation department, although all students interested in the program are encouraged to apply. A well rounded CORE applicant will be of Junior standing or higher, have a GPA at or above a 3.0, possess good time management skills, display an understanding of the mission and structure of CORE, and can identify personal goals that are in line with the program. Leadership experience is beneficial but outdoor experience is not a factor in the selection of CORE students. How might I benefit from this program? CORE provides a unique and challenging opportunity for extensive professional and personal development. The benefits of the CORE experience extend well beyond technical skills and certifications. The combination of academic and experiential learning components provides an enhanced understanding of adventure education, natural resource management and outdoor leadership. Students will develop critical communication group management skills while also developing individual leadership skills. Transference is an important component of our program and as skills learned in CORE are applicable to many careers outside of the Adventure and Experiential Education fields. CORE can also be an excellent gateway to exciting seasonal jobs and post-college careers. Over the years we have developed working relationships with numerous employers in the Adventure and Experiential Education fields. Students will have the chance to network with current outdoor professionals through community involvement projects, lectures, and frequent job postings. Students accepted into the CORE program are expected to be active participants, both in the classroom and out in the field. Course assignments will include papers and projects, as well as classroom and field presentations. The program is intensive, demanding of both time and energy. The more effort each student puts in the greater the success at the end. The CORE curriculum does not allow time in the schedule for outside courses or a full-time job. More important than the skills one already possesses is the willingness to try new things and the desire to learn. Students are not expected to have extensive field experience. However, a general comfort in outdoor settings and a healthy lifestyle is critical. The CORE program facilitates learning through exposure to different activities in a variety of settings, with the intention of establishing a solid foundation upon which participants can continue to build. What costs are covered by the $1,900 activity fee? 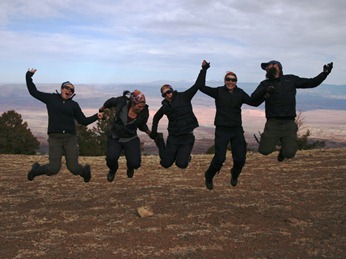 The activity fee covers food, transportation, some group equipment and lodging costs for most of the field experiences. It also covers individual certification fees (e.g., Wilderness First Responder, Leave No Trace Trainer). Students are responsible for supplying the basic personal equipment expected of professional outdoor instructors and for purchasing their own textbooks. For the CORE gear list, please visit this link. Can I take other classes and do CORE at the same time? The amount of time and energy that CORE demands does not allow for students to take classes outside those offered through the program. When students register for CORE they register for all the courses in the CORE block at the same time. Substitutions for a class that a student has already taken prior to CORE can be made on an individual basis. Is CORE offered in the fall or summer term? The program is currently only offered in the spring term. What type of gear will I need? Students are expected to provide personal gear, consistent with that expected of professional outdoor instructors. This includes, but is not limited to, personal clothing suitable for living in the out-of-doors for extended lengths of time, a sleeping system (sleeping bag, ensolite pad, ground sheet), a backpack, and backpacking boots. A detailed equipment list can be found here. How many credits can I earn through CORE? Undergraduate students currently earn 15 credits. 160 of the 320 professional development hours required for an Outdoor Recreation, Parks and Human Ecology degree may also be fulfilled. Graduate students can earn up to 12 credits for their participation in the program.